002.03.12 Why Is China Buying Gold? A better explanation for the gold-buying binge of Chinese citizens is that they are using the shiny commodity as an inflation hedge, as the Financial Times recently suggested. Yet the buying of gold has increased while inflation has eased. Inflation has not eased. In fact, if you check out ShadowStats, you’ll see the US sitting at about 10-11% actual inflation while the government says inflation is much lower. The world is inflating it’s money because it can and because wars have to be paid off somehow. Hope you read the article. The author comes to an interesting conclusion about why Chinese are buying gold… but I think it’s for ALL the reasons mentioned in the article, not just capital flight. I have mentioned elsewhere on How To Buy Gold that I have learned a lot from Franklin Sanders at the Moneychanger. I thought these words today were particularly prophetic. Grasp this, remember this, never forget this: silver & gold are in a bull market, stocks & the dollar in a bear market. Silver & gold tomorrow will be worth more than silver & gold today; stocks & dollars tomorrow will be worth LESS than stocks & dollars today. Align your assets accordingly, or suffer with the deceived masses waiting for Washington to save them. I read this article about why and how gold backed currencies work. I’ve never seen it explained this way before and wanted to share it here with you. Which countries, funds, and individuals hold the most gold? CNBC has put together a fun slide show to show you who has the most gold. However, that doesn’t matter if YOU don’t have any gold. Saying that Nouriel Roubini, one of the world’s leading economists is pretty much dead wrong is an interesting way to make friends. But that’s exactly what Gerald Celente has done. Celente also says he is now 100% in gold after realizing some gains in the Swiss Franc. Marc Faber says put 25%-30% of your money into gold. 008.26.11 Is Ben Bernanke Evil, or “The Problem”? A good quote I read and wanted to share. 008.25.11 BAD Advice: Should You Join The Next Great Gold Rush? A friend of mine sent me this article and asked me for my thoughts. I think he may have gotten more than he asked for. What follows is my response to my friend, and to the advice (which I believe was BAD advice designed to confuse you into hiring a financial planner) that was given in the article. What you find in Bold, Italic, are direct quotes from the original article. From 1979 until now, it has only doubled in price. Not sure how this is relevant. Either choose a longer window or a shorter one. In 1979 I was being born. Could you have bought stock or gold in 1979? Me neither. Regardless, it’s pointless argument to talk about a 32 year investing window which starts in 1979, when 1979 is NOT an important year for gold, and 2001 is a very important year. It’s completely an arbitrary set of years chosen only to prove his point, but not based on anything that would matter to someone who really wants to understand how to invest in gold/silver. Since 2001, gold has quadrupled against the dollar. It will continue until gold goes into a bubble. That’s when you sell. From 1979 to 2000, gold lost about half its value. And from 1979 until now, it has only doubled in price. I haven’t looked back at 1979 and compared it to 2000, but if Ted has, great. Again, 1979 until 2000 is completely arbitrary and not tied to the natural pattern of silver or gold at all. Also, I was 20, and only remotely interested in stocks, and not at all in gold. Were you interested in investments or investing in 2000? Let’s say that you bought gold in 1979 (when you could buy health insurance for the entire family for $17 a month), and sat on it for 32 years. Adjusted for inflation, you’d currently have about half of the buying power of the money you started with. The result of gold’s price movements is that it acquires little or no real value over time. That’s right. The cost of a gallon of gas, when priced in gold/silver, is about the same as it’s always been. The problem is that humans have the ability to play with paper money. And they are playing aggressively right now. Their playing is making gold, silver, and the cost of everything else go up. The only things that are actually holding their value in light of this massive currency debasement are commodities, with gold, and silver in particular, taking the lead. This is because gold is a commodity, meaning that its value is determined by global trading based on supply and demand. That’s right. Something real that trades based on something real and measurable. What a concept. When demand goes up (as it will continue to do until the bubble bursts), so does the price. So I’m choosing to participate in the market where the demand is increasing greatly. One thing affecting price fluctuations is the large trading volumes of hedge funds. That’s true. But most hedge funds aren’t even involved in gold (and silver) – yet. When this trading shifts rapidly, individual investors can be left in the depreciating gold dust. That’s a cute dramatization, but let me ask you… At what point in your life would you hold a handful of gold (dust or otherwise), and be disappointed to do so? Gold always holds some value (and goes into bubbles and busts which are easily studied and applied or the last 200 years or so), while the value of a paper stock can go to absolute 0 (or lower) overnight. Even for a precious metal, the price of gold is especially fickle because it has fewer industrial uses than silver or platinum. That’s true, and not true. Silver is actually MORE fickle because it is a SMALL market. There’s just not that much physical silver above the ground compared to the demand, so the silver market actually swings more wildly than the gold market. Oh, and as for fickle? Have you seen what stocks are doing on an almost daily basis? Up, down. Up, up, down, down, down BIG, UP BIG, etc. How is that less fickle, or a better option? Gold’s value is more emotionally based, and the emotional allure of gold is summed up by one of the biggest drivers of demand: the “love trade” — meaning jewelry for gifts. Yep. And the biggest gold/silver giving season (likely in the history of the planet) is about to get underway, between Diwali, Christmas, Chinese New Year, and Valentine’s Day. Another emotion is associated with gold: fear — fear that financial institutions will collapse. Many more collapses are on the way. People also buy gold out of greed, believing it will continue to rise indefinitely, as tech stocks did in the 1990s. Remember when that bubble burst? The difference is that, unlike tech stocks, gold has a long history of bubbles. The world has a long history of bubbles (and also of greed). I would argue that greed might have motivated the author of the article to write the piece I’m currently critiquing. Tulip Mania in Holland in the 1600s is a great example. There’s an unbelievably dry book called “The Next Great Bubble Boom” which shows mainas back as far as the 1200s. You can pick that one up if you want or one that’s easier (though more generic is called something like “The Madness of Crowds”. Gold/Silver, Real Estate, Latest/Greatest all follow a predictible history of bubbles. Understanding the cycle is actually pretty straightforward. I’ll show you a YouTube video that explains how to know when to sell (in less than 3 minutes) if you’re interested. When stock markets and economies are uncertain, many institutional investors like to park cash in gold for the short term. Among the most common ways to invest in gold is through exchange-traded funds (ETFs). The price of shares (traded like shares of stock) is determined daily by the value of underlying gold stored for investors. I highly recommend to STAY AWAY from ETF’s, especially after the bubble begins in earnest, unless you really understand what you’re doing. Especially silver ETFs. Some are stating that they have physical reserves that they likely do not have (simply lying), and will likely be one of the triggers which eventually causes the bubble to pop. Yes. I’m not sure why one of the oldest things in monetary system of the world (gold) is considered “alternative”. But if so, do what he’s saying here and get some “alternative” investments. How is he now (at this point in the article) advocating what he argues against at the beginning of the article? I’m confused what he’s trying to do, unless he’s trying to confuse. In the guide, I advocate (if you’re playing it safe) putting 10% aside into gold/silver. More if you want to, but at least 10%. 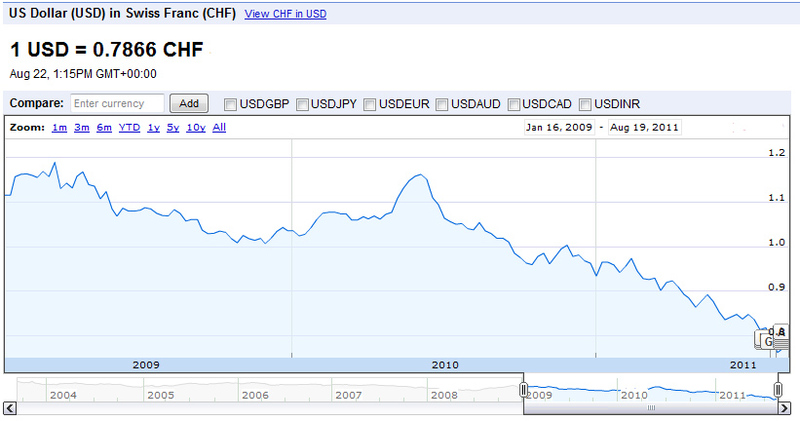 When the markets declined in 2008, gold went down with them. Point being? Everything declined, because money contracted dramatically (and will continue to do so, no matter how much money the fed prints). Percentage-wise, you would have been better off in gold/silver than stocks. I don’t know about bonds at all. But if you started investing in gold or silver at the bottom in 2008, you would be up by almost 400% as of 2 days ago. You can’t say that AT ALL about stocks. Also, short-term investments in gold can be used to protect against currency declines. If the dollar declines against foreign currencies, an ounce of gold will be worth more dollars. Yep. So buy gold. Seriously, why is he arguing for the thing he’s supposedly arguing against? 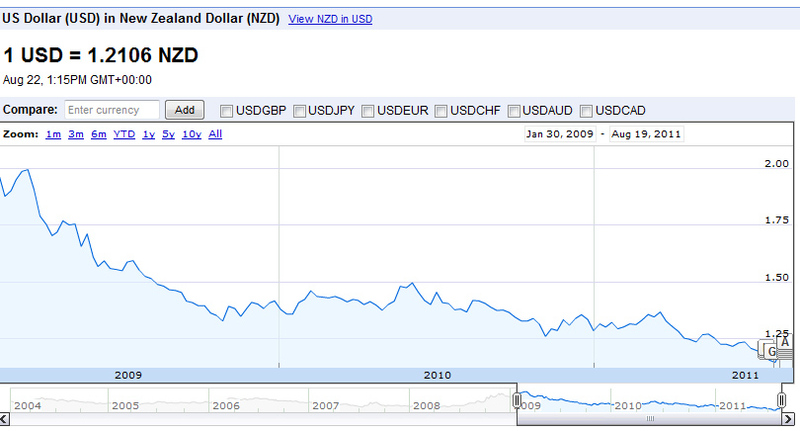 As the buying power of the dollar has declined against the yen and the pound recently, gold has gone up. 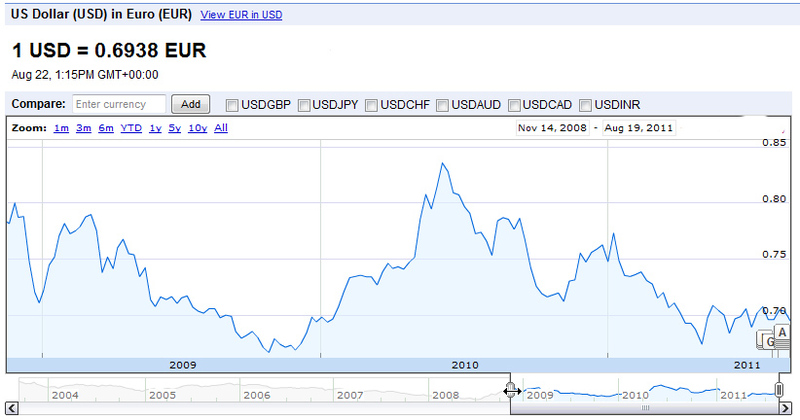 Check out this page of history of foreign currencies against the dollar over the past few years. Make no mistake… this is not an accident. This is intentional on the part of the fed and the government. Devaluing the dollar is probably the only way the United States will ever pay off it’s 70+ TRILLION in debts and liabilities. 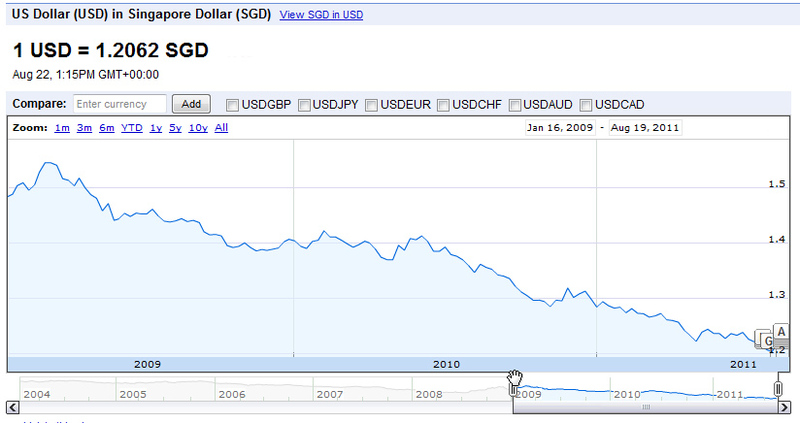 I believe that devaluation will continue. It pretty much has to. But the use of gold in such strategies can be quite tricky, so I don’t generally recommend this for individual investors. Even when used sparingly and carefully in broad portfolios, gold has the fundamental problem of being volatile in the long term. It doesn’t produce what we primarily invest to obtain: a future income stream. Stocks provide an income stream in the form of dividends and earnings growth, and bonds do so in the form of interest. Gold offers none of these. Stocks and bonds are volatile as well, especially under the new rules of money and the new rules of trading. It’s no longer fundamentals (profit/loss, potential growth, management team) which determine what to invest in. Some significant portion of trading is being done by computers, which don’t care about these qualitative judgments. Computers care about the numbers. Humans are behind the numbers (and mostly behind the computer decisions), but for the next few years (until legislation or whatever other methods catch up) the market direction will not be determined by fundamentals. It will be determined by computers, which will continue to be programmed by greed. As far as long-term profit streams, Ted is making an argument for a philosophy that, since 2001, has confiscated from my parents (and many of their generation) over 50% of their retirement. For me, it’s time to listen to, and act on, some different advice. Despite these shortcomings, gold can play a strategic role in sophisticated portfolios. But because gold can’t deliver long-term returns, it’s not the Holy Grail touted in the ads. There he goes again getting high and mighty and advising people to remain dumb (unsophisticated). Stocks ONLY deliver long-term returns if you buy low and sell high. Good luck figuring out how to do that in the next 5-7 years. After that, it will improve. But it’s going to be a challenging decade. Of course dold is not a holy grail. Nothing is… well maybe the actual holy grail, but even that’s in dispute. My summary: Millions of people will get involved in gold. Millions of people will get burned by it (as they did with the dot-bombs, as they have with real-estate, as they will for the rest of their lives.) But this will happen to them in ALL aspects of life until they decide to study and understand what they are investing in, and also understand how the cycles of wealth in the world work. I am choosing instead to get educated, and share some of what I am learning. I definitely don’t have all the answers, and am working REALLY hard to study and understand. Within 5 Years, America will be back on a gold standard, through returning the dollar back to it’s original gold standard. Really? The fed loaning money to the banks in MASSIVE volumes wasn’t a risk to the Fed or the Taxpayer? 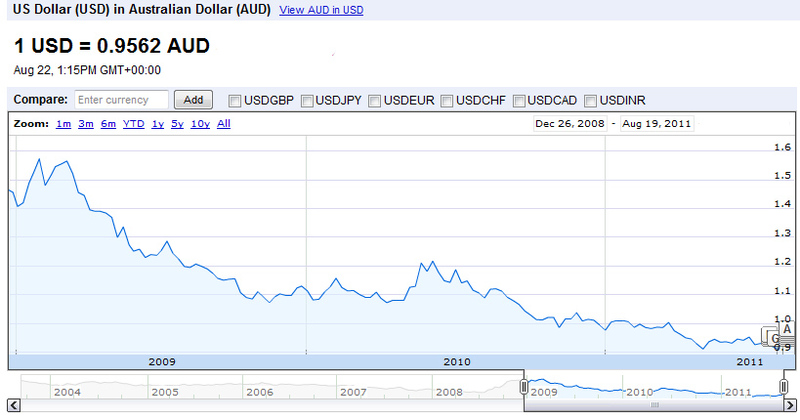 The US Dollar has lost significant value in the last 2 years. This looks like risk to me.